At its core, burnout is a result of emotional and mental exhaustion. Many geriatric physicians and other health specialists often feel burnout, loss of control, and the burdens of an unreasonable workload. They expend so much energy worrying about the health of their patients that their own issues go unresolved. As a result, burnout among this particular group of health care providers is steadily growing. To deliver the best-quality care to older adults, it’s crucial for geriatric physicians and other long term care and end-of-life specialists to focus on what matters most: how to communicate effectively and manage emotions. It’s well known that physicians commonly experience distress and grief in response to their patients’ suffering, which may be particularly acute in long term care and at the end of life. If clinicians’ emotions aren’t managed properly, burnout is guaranteed and patient care will be affected. Research has shown that burnout leads to medical errors, lower compliance, and reduced patient satisfaction. Team productivity, morale, and staff turnover will also suffer if burnout and physician wellness are not a priority. Taken to extremes, emotional fatigue can increase depression, substance abuse, poor self-care, suicidal thoughts, and other struggles. There are many contributing factors that create another common burnout phenomenon, often referred to as compassion fatigue. We intuitively know this is an issue, yet what are we actually doing to effectively address this? How can you determine whether one of your geriatric physicians or other team members may be experiencing burnout? • What is your team’s “energy score,” from 1 to 10, with 10 being the highest? Most teams have a mix of high-, middle-, and low-energy team members. If you average the team members, what’s their score? Be honest if you want transparency and to achieve the best results. • What is your team’s “smile score,” from 1 to 10, with 10 being the highest? Most teams have a combination of high, middle, and low “smilers.” If you average out the team, what’s their score? • What your team’s “story score,” from 1 to 10, with 10 being the highest? Everyone has a story to tell. Some doctors are extremely polished and well trained, and some are not. Some are so refined that they appear to others like superstars, while others need more rehearsal. How do you rate the “story” score or the experience your team creates for each patient? Then what do you do with these numbers? Follow the trend and work to raise them as high as possible. Many people believe you can’t change these metrics in a team, saying, “I can’t just tell my team to have more energy or smile more, they’ll think it is superficial and fake!” The reality is, when the team is trained correctly, you can consistently raise their business personality scorecard, and the impact is quick and profound. Consider the business personality scorecard of a physician who’s burning out, with low energy and low smile scores, and often not creating a great experience for the patient and the team. Burnout training workshops are available to help diagnose and treat these issues by focusing on how to identify, measure, and influence psychology, emotional literacy, and nonverbal communication skills. These courses, which could meet part of the required CE/CME hours, aim to enhance patient care by improving communication and physician mental health. • diagnose and treat worrisome behaviors in patients and health care teams before they have a chance to escalate to the next level. • Continue listening. Recognize their needs and pain points, but also that some of their concerns can vary by age or group. • Encourage professional fulfillment. Enrich physicians’ feelings about the meaning of their work, allowing them to recognize that they’re making a difference in others’ lives, which can lead to increased satisfaction, loyalty, and longevity. • Reduce the chaos. Invest in extra workspace when possible, add more team members, increase office hours, and incorporate interventions to create calm in the workplace. • Support work-life balance. Strive to provide flexible schedules and part-time options, and enlist the help of retired geriatric physicians or “floats” to fill in any gaps due to family illness, death, births, or other needs. • Increase work control. A crowded schedule and lack of control can trigger geriatric physician burnout. Extend appointment times and schedule time during the actual workday for mandatory housekeeping-related tasks. • Start a geriatric physician well-being initiative. Assess doctor satisfaction and monitor any emotional and work-related exhaustion among team members. Offer educational programs, such as burnout training, focused on communication and self-awareness to reduce physician burnout and improve patient care. 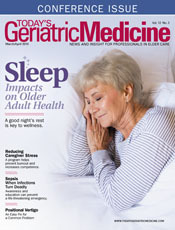 Offering “burnout” resources to increase resilience and boost work engagement for geriatric physicians— along with establishing a positive work environment that encourages a work−life balance—can help organizations reduce burnout among team members over time. — Rich Castellano, MD, a Wall Street Journal best-selling author, is the founder and medical director of ImageLift. The Tampa, Florida-based surgeon has been instrumental in the nationwide movement to provide CE/CME burnout training for physicians, surgeons, and health care providers. He teaches health industry professionals through his award-winning online coaching and mentoring program at PracticeProfitabilityMD.com.